In Speaker v. Speaker, 468 MDA 2017, filed March 16, 2018, Husband filed a Petition requesting a modification or termination of his alimony Order with the Cumberland County Court of Common Pleas. Husband claimed that there was a substantial change in circumstances in that he had a number of medical conditions and intended to retire in a few years. During the course of discovery, the deposition of Husband’s doctor was taken and the doctor testified that Husband was undergoing a new course of treatment and he believed that course of treatment would be successful. Husband testified that although his income had increased since the entry of the alimony Order, that he intended to retire in a few years time and his retirement was a change in circumstances sufficient to warrant a modification of the alimony Order. Husband requested a decrease in alimony and an ultimate date of termination of the alimony Order. The Trial Court granted Husband’s request and ordered a decrease in alimony in 2017, 2018, and 2019 and terminated the alimony Order effective 2020. Wife appealed the issue to the Superior Court. Wife’s appeal claimed the Trial Court did not consider all issues, including the factors for alimony set forth in the Divorce Code, and claimed that the Cumberland County Court had a “personal bias against indefinite alimony”. Wife argued that Husband’s desire to retire in the future was not a substantial and continuing change in circumstances which warranted a modification of the alimony Order. The Superior Court agreed with Wife and acknowledged that Husband’s request for modification was premature as he claimed he intended to retire “in the future”. The Superior Court did not specifically address Wife’s claim that the Cumberland County Court had a personal bias against indefinite alimony. The Superior Court did, however, point out that the Trial Court failed to follow the dictates of the Divorce Code and relevant caselaw. In Leicht v. Leicht, 164 A.3d 1246 (2017) The Superior Court upheld the findings of Judge Menges of the York County Court of Common Pleas. This case involved a couple who were both age 50 at the time of their divorce master’s hearing. They had been married for 18 years prior to their separation and had 3 children who were all adults. Husband was employed in a manufacturing facility during the marriage and he earned approximately $44,000 per year. Wife worked as a Licensed Practical Nurse during the marriage, however, following the parties’ separation, she suffered from a number of mental and physical illnesses and conditions. Wife was receiving disability benefits at the time of the master’s hearing. There was minimal marital property to be distributed by the divorce master, and neither party made a claim of marital misconduct in the proceedings. The divorce master determined that wife had no earning capacity and he ordered husband to pay alimony to wife for approximately 1 year. Wife filed exceptions to the Divorce Master’s report and Judge Menges, in ruling on the exceptions, entered an order requiring husband to pay alimony to wife for an indefinite period of time. Husband appealed this Order to the Superior Court. In his appeal, Husband claimed that the award of alimony to Wife was inappropriate because Wife would be entitled to additional government benefits, if she applied for them. The Superior Court agreed with the trial court and found that social welfare benefits are “a last resort, not a first one”, and found that according to prior case law, “alimony should be determined without regard to whether the dependent spouse would be entitled to public assistance or other social welfare benefits.” The Superior Court inferred that, pursuant to the Divorce Code, Wife’s financial welfare was Husband’s responsibility and thereafter, social welfare benefits could be utilized to subsidize Wife’s other resources. A military pension is subject to a federal statute which permits the states to divide a veteran’s military retirement pay in a divorce action. The recipient of a military pension may waive a portion of his retirement pay in order to receive disability benefits, which are not taxable. The statute does not permit the distribution of the disability pay in divorce, nor does it permit the waived portion of the retirement to be considered marital property. The Howell case challenged this portion of the federal statute and requested that the Court determine whether, after the divorce and division of the pension, the non-military recipient spouse’s portion of retirement pay can be reduced when the military recipient waives a portion of his retirement pay in order to receive disability payments. The Howell case involved parties who were divorced and had entered a QDRO for distribution of the Husband’s military veteran’s retirement pay. Following the parties’ divorce, and after the division of assets and entry of the QDRO, the Husband waived a share of his retirement pay in order to receive federal non-taxable disability benefits. As a result of this, the portion of Husband’s pension which Wife received pursuant to the QDRO was reduced. The Supreme Court found that although Husband’s right to waive a retirement benefit in order to receive a disability benefit resulted in a loss to Wife, in light of the federal statute, Wife is unable to recover the amount of retirement pay she lost due to Husband’s waiver. 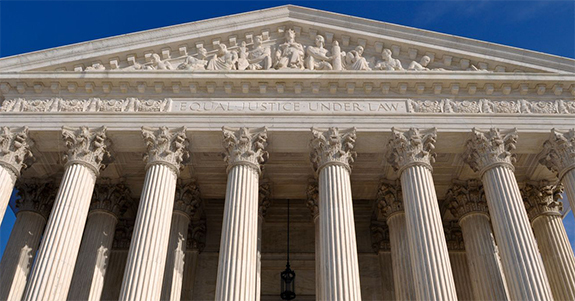 The Supreme Court found that the federal statute providing for retirement benefits superceded state laws regarding divorce and property distribution. This case will force domestic practitioners to rethink the distribution of military retirements in divorce, in light of the new uncertainty regarding the distribution of a marital federal pension. If you have any questions regarding this Opinion or how it may affect your case, please feel free to contact us. The parties in Watts shared legal and physical custody of their child on an alternating weekly basis pursuant to a Court Order. Both parties resided within the School District where the child attended school. At one point the school permitted the child to have a bus stop at both Mother’s and Father’s residences. In 2012, the School District changed their policy and notified Father that the child could only have one bus stop and that it would be Mother’s residence, as she was the child’s default address. Watts at page 2. Thereafter, Father started an action and requested injunctive relief to require the School District to provide transportation to both parents’ residences. In support of his claim, Father cited the portion of the School Code which requires a School District to provide free transportation for any “resident pupil”. Father argued that the child was a “resident pupil” of two homes and that transportation must be provided to both homes. The School District argued in response that a student may only have one residence for purposes of the School Code. The Trial Court found for Father, and limited their decision to the facts of the case and claimed it to be only applicable where: “(l) both parents live in the same School District (2) the student is subject to an equally-split, shared legal and physical custody agreement and (3) a school bus already serves each residence and could accommodate the student without any further cost or adding an extra stop.” The School District appealed the Trial Court’s order to the Commonwealth Court. Watts at page 4. The Commonwealth Court reviewed pertinent case law and determined that because a prior case had held that a student of separated parents who lived in two different School Districts was a “resident pupil” of both School Districts, likewise, a child could have two residences within the same School District. The Commonwealth Court determined that a student may have more than one residence for transportation purposes and the school must provide transportation to both residences. Watts at page 6. The School District sought review by the Supreme Court and filed an appeal to address the issue of whether the Public School Code requires the School District to provide transportation services to a student to more than one location within the School District. The School District initially argued that a student may not have more than one residence under the Code and therefore it properly limited child’s transportation to one parent’s residence only. Alternatively, the School District argued that even if a student may have more than one residence under the Code, the School District still has the discretion to limit a student’s transportation to only one of the residences. The School District further argued that it did not abuse its discretion because the changes to their transportation policy “help conserve and better allocate limited public funds.” The School District suggested that it was unreasonable and absurd to assert that the legislature intended the School District to bear the additional cost of providing additional transportation to some students “merely to accommodate their parents particular domestic circumstances.” Watts at page 10. 1. The School District owes a duty of transportation to the child as a “resident pupil.” The contested issue is whether this requires transportation to Father’s home, which is a second residence. 2. “The duty to transport the student is triggered by his status as a resident of the School District, and necessarily his residence within the school district.” The Court determined that when a School District provides free transportation, this duty to transport means “to and from” the students’ residence. 5. The parents in this case have a shared, alternating weekly custody arrangement, and accordingly the child has two residences. “Under these circumstances, we conclude that the legislature and the Department of Education intended for the School District to provide transportation to both residences in order to further the goal of compulsory attendance.” Watts at page 20. The Court in Watts specified that these requirements are based upon the School Code and the parties equally shared custody arrangement. Whether this applies to other custody arrangements is not made clear by the Watts case. It is also important to note that the School District’s budgetary concerns regarding transportation were also not considered in this case, because the language within the School Code does not provide for those considerations. In Huss v. Weaver, 2014 Pa. Super. 238, the parties entered into a written agreement, “in which they agreed that if their relationship resulted in the birth of a child, Huss (mother) would have primary physical custody and Weaver (father) would have specified visitation rights, and that if Weaver sought court modification of these terms he would pay Huss $10,000 for each such attempt.” The parties executed the agreement in 2008 and they had a son in November of 2010. In December 2010, Weaver filed for custody. Thereafter, Huss filed a complaint with the trial court for Weaver’s breach of their agreement and his failure to pay her $10,000 as provided for in the contract. The trial court dismissed Huss’ complaint, ruling that the provision which provided for the $10,000 payments was “void as against public policy.” Huss thereafter appealed to the Superior Court. It is important to note that Weaver was a practicing attorney at the time he entered the agreement with Huss. Weaver had previously provided Huss with legal counsel, and a member of Weaver’s law firm drafted the agreement at issue herein. The trial court found for Weaver and likened the agreement to an agreement for child support. Prior caselaw holds that the right to child support belongs to the child, and a parent cannot “bargain away” that right. This case is important because it discusses a contract for custody made between parents before their child was even conceived. Written, signed agreements are viewed as binding contracts by the court, no matter what the subject matter. A party to any type of contract should review all issues with an attorney before “signing on the dotted line”. Attorney Advertising. This website is designed for general information only. The information presented on this site should not be construed to be formal legal advice nor the formation of a lawyer/client relationship.